Gentle pain relief from heat therapy and an invitation for relaxation is yours when you purchase the InfraMat™ LargeMat-12JT. This powerful tool for healing is made of 546 individual tourmaline and jade stones. The rare power of these stones will allow for relief and relaxation of most parts of the body. The chemical compound of these stones in this product allows for deep soothing action on muscles from the combination of heat along with the unique Far Infra Red rays that these stones start to emit when electricity passes through them. Tourmaline and jade are distinctive stones that offer several benefits for the human body. They help your body to get rid of cellular waste and allow you to function at your highest level. The stones will also combine to reduce the buildup of lactic acid in muscles. This is often prevalent after workouts. This can also stimulate fat loss and reduce the buildup of free radicals in the body. The liver and kidneys of the human body also benefit from using this product, as it will allow for cleansing and a smoother functioning body. 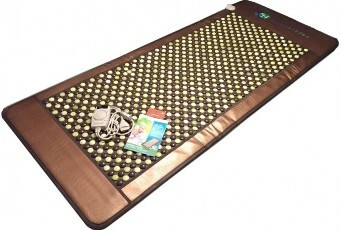 Use of the InfraMat™ LargeMat-12JT has also been shown to diminish anxiety and depression a person experiences. The benefits of the jade and tourmaline don’t end there. These gems have been widely known to remove harmful toxins from the body and offer significant relief from both chronic and acute illnesses. Another great benefit of the tourmaline and jade in the InfraMat™ is that it can improve the way a person feels mentally as well as physically. These gems are crushed and placed in tiles in the heating pad. As they work with your body, the presence of negative ions is increased. Negative ions come from natural sources, and when they are introduced into the bloodstream, they will enhance a person’s mood. These molecules are all natural and found in most natural outdoor settings, including waterfalls, oceans, beaches, lakes, and mountain areas. Using this valuable heating pad is one of the simplest and most convenient ways to boost exposure to negative ions. The immune system will also benefit from greater exposure to negative ions each day. Having a healthier bloodstream and metabolism will naturally help improve your nervous system and overall health. It will also help reinforce collagen, which will help build stronger, thicker hair; make skin more pliable; and reduce wrinkles as a person ages. Biochemical reactions that bring larger serotonin and melatonin levels into the brain are produced using InfraMat™. Negative ions help improve brain function and also help produce a calming mood that provides natural stress relief. It is definitely going to allow for a more valuable and efficient life experience each and every day. If you are looking for a treatment for pain or a great method of relaxation, purchasing the InfraMat™ LargeMat-12JT will lead to a major life change. There are few products that can provide treatment and relaxation to your physical, mental, and spiritual well-being. The awesome, all-natural power of the jade and tourmaline stones will work to keep you relaxed and pain free.